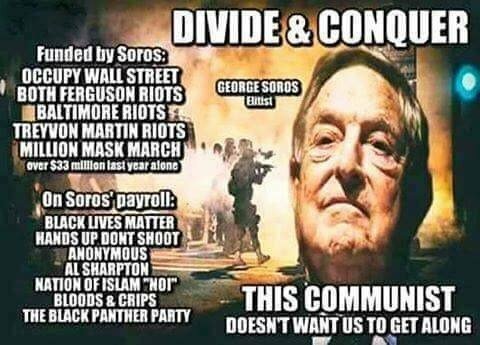 Think about it, Soros is the one who has been destroying Western Civilization by importing Islamic maniacs still living in the 5th century into Europe. Sweden is his poster child of national destruction. Why? Simple: age-old strategy “Divide and then conquer”. Also known as Divide and Rule. Europe is a total mess right now, with their stupid sold-out globalist leaders selling them out left and right. Create a mess and then offer to clean it up UNDER TOTAL CONTROL OF GLOBALIST LEADERS, GLOBALIST MILITARY, GLOBAL CURRENCY, etc. This article (GEORGE SOROS: The Back Story No One Talks About) was originally created and published by State of the Nation and is republished here under “Fair Use” (see disclaimer below) with attribution State of the Nation.